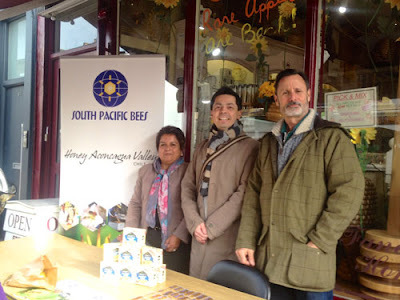 We had the pleasure today of collaborating with the head of the Chilean Beekeepers Assco, ‘Colmenas De Aconcagua’, Mrs Ana Maria Barrera and Luis Vargas consultant for South Pacific Bees in Chile. Luis contacted The Hive Honey Shop as he had heard we are the top honey shop in the UK. Luis and Ana are working together with the Chilean Beekeepers network and the Chilean government, who are supporting their countries beekeepers with product development, research and exporting opportunities. Wish the UK would learn from Chile and support our beekeepers here. South Pacific Bees, the trading name for the European leg of Colmenas De Aconcagua are developing honey products and researching into the therapeutic properties of their local Chilean honeys similar to Manuka. Due to the extremely high price that Manuka now fetches, under the complete support and backing from the New Zealand government, it is no surprise that Chile have woken up to this business model. I was introduced to Ana Maria Barrera, manager of the Colmenas De Aconcagua beekeeping association with 500+ members. Ana’s husband Jose Luis Arias is president and has over 1000 production hives. The total number of beekeepers in Chile is 4,500. The requirement to be considered a beekeeper within this statistic is that you run 20 or more hives. 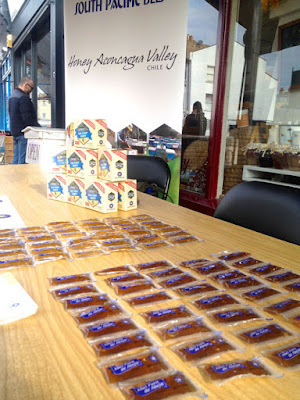 The task today was to see if a new prototype honey product would appeal to the UK market. 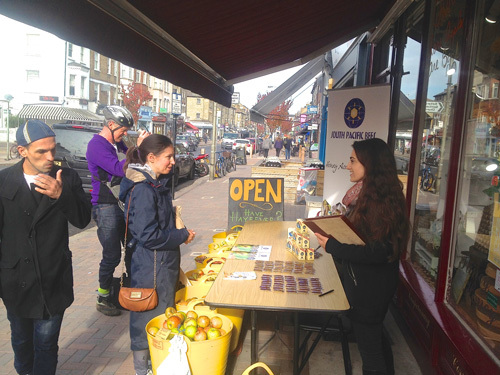 We set up a table and market research was carried out. At present South Pacific Bees, the trading name for the European market, have teamed up with a large company in China. Together they will explore the potential of creating a similar honey to Manuka once all the research data is confirmed. The location of Colmenas De Aconcagua in Aconcagua valley, gives it a comparative advantage of high interest, because the Andes mountain range acts as a natural barrier against pollution risks, providing a mild climate that allows for healthy, disease-free bees and honey. Some of the mono floral honey they gather are: Soapstone, Avocado, Tebo and native flora and fauna. Chiles land mass is boxed in on all sides by natural barriers such as the Atacama Desert which is a plateau in South America, covering a 1,000-kilometre (600 mi) strip of land on the Pacific coast, west of the Andes mountains. It is the driest non-polar desert in the world. Charles Darwin came to the point where “the desert of Atacama commences, where nothing can exist.” Considered the driest place on Earth. I was told by Luis no bacteria can live there. Also with the Pacific ocean as a barrier they are pretty well protected. Great place for beekeeping. The market research was a success and Ana made a gift to us of a number of their special honeys. Ulmo Honey, which is very light in colour, has high anti bacterial properties like Manuka. Currently the largest university in Chile is conducting research that will be of great interest. Quillay honey, dark med in colour has antioxidant properties of significant value. We were very please to help in their venture contributing to the quality of life for their people and their commitment towards society and the environment.